This morning Coleman and I had our 2nd prenatal appointment and 2nd ultrasound. Sweetpea is measuring right on track, around 12 weeks and 6 days. We had our first round of genetic testing looking for neural tube defects and down syndrome, and everything came back looking great!! On the ultrasound this morning, we were able to see both arms and legs, nose, kidneys, stomach, spine, both hemispheres of the brain, a pumping healthy heart (We got to hear the heartbeat too! ), and both feet and hands. We were also able to count Sweetpea’s fingers, and they were all there! Phew!! Sweetpea also clasped both hands together for us as if he/she was saying “Namaste”…too cute! This baby is going to be doing yoga in no time! We were so happy to hear and see that everything looks good so far! I also had some blood work done to confirm no downs syndrome or defects, and we will get the results next week. All in all, it was a great appointment! We will hopefully find out the gender of Sweetpea at our 20 week appointment in February! 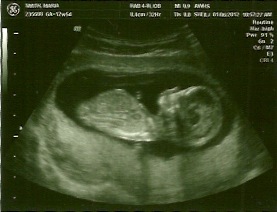 Below you will see the ultrasound photo of Sweetpea from today. Even though Sweetpea is really only the size of a plum, it is amazing to me how big and how human he/she looks compared to the ultrasound photo at 8weeks. They grow so fast! 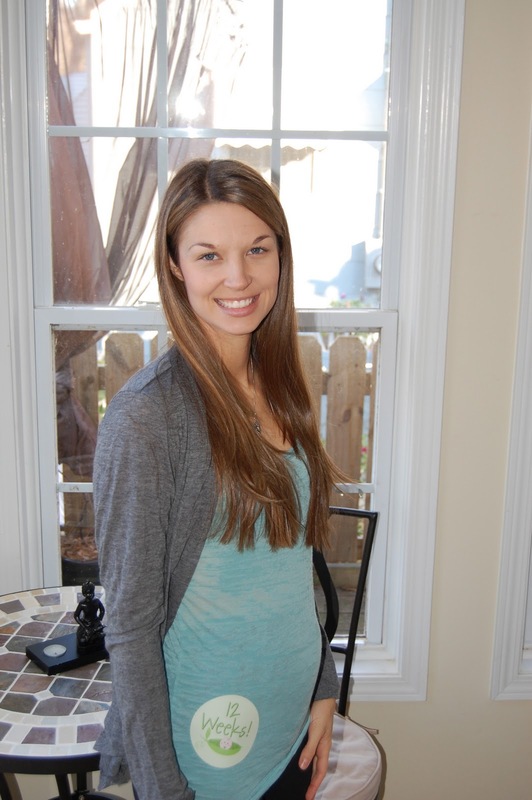 You will also see a 12 week "Baby Bump" photo of me. Enjoy!! Much love to you and Coleman!